Every year when we unpack the Christmas tree decorations we seem to have about twice as much as we remember packing away. 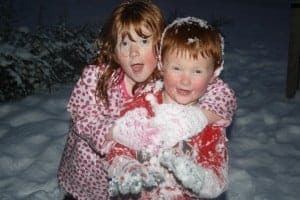 One thing I couldn’t not put up though would be all of the lovely Christmas cards that the kids have made over the years – each one of them is different and was made with love and Christmas excitement. They show how much they’ve grown up over the years and every year when I get them out, I sit and look through them all with a smile. I display them all on my Living room door so everyone who comes in to the house sees them and almost everyone comments about how lovely they all look together. I can’t wait to add this years to the collection…. It really is that time of year again. Summer’s over, the kids are back at school, X Factor’s back on the TV and the C word is starting to come up in the conversations all around me more and more. Which can only mean one thing! It’s time to dust down the long abandoned Christmas blog and start getting prepared for my favourite time of year. I’m trying to get organised enough that everything is done by the 1st December so I can enjoy the run up to Christmas with one less thing to think about. If you are (and I hope you are) then consider this to be your two week warning and if you haven’t already sorted out your Christmas spending budget and got your mini Christmas organisation book done, then you need to read this post before you do anything else. One of our most Magical Christmas moments every year…. Have you ever heard of Portable North Pole? If you haven’t then you’re in for a treat this Christmas. Guaranteed! Portable North Pole helps you to make a video from Santa personalised for you children and considering it’s a free service, the quality of the video and the level of personalisation is excellent. It only takes about five minutes to upload a photo of your child and fill in the little prompts to personalise the video and they the link to your completed video is emailed to you in minutes. We’ve done this every year since I found the website and every year the expressions on their faces have been absolutely priceless and definitely one of the highlights of our family Christmas build up. Activity Advent – Find the best Christmas lights in your neighbourhood…. Go for a walk (or drive) and find the best Christmas lights in your neighbourhood, then come home to a nice mug of hot chocolate. Activity Advent – Snow flavoured ice cream…. 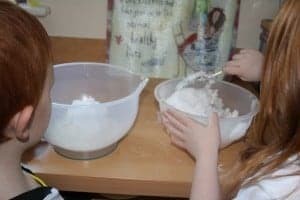 Seeing as there may be snow in the next few days I thought now would be a good time to share one of my favourite recipes of all time – Snow flavoured ice cream! First you need to send a small child outside in to the snow with a big bowl to gather up some clean fresh snow, making sure that they know that the top of the wheelie bin is not the best place to gather clean snow from! Next, mix 1 cup of milk, 1/2 a cup of sugar and 1 teaspoon of vanilla essence together in another large bowl. 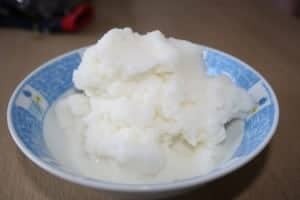 Add the snow bit by but to the milk mixture and just keep stirring until it looks like ice cream. It’s ready when it gets to this point and you need to eat it straight away because it does melt quite quickly! Add more snow if it’s a bit watery and pop the bowl back into the freezer to harden it up a bit. Pity that it doesn’t snow more often or this would definitely be a regular in our house! It’s not long now you know….